Co-founded in 2002 by brothers Bill and Randy Simon, and their friend and business partner, Scott Redler, the three men named the restaurant after Bill and Randy’s father, Freddy Simon, a World War II veteran. Freddy grew up on a farm near Colwich, Kansas and signed up for the infantry in the U.S. Army at the first opportunity. After years of fighting in places around the Pacific Rim during World War II, Freddy earned the Purple Heart and the Bronze Star for his service, and returned home safely. Following World War II, he worked hard for 56 years while raising his family. Freddy believes he is “the luckiest man in the world.” In between his visits to high school history classes, Freddy actively participates in veterans groups, and takes part in World War II memorial events across the United States. 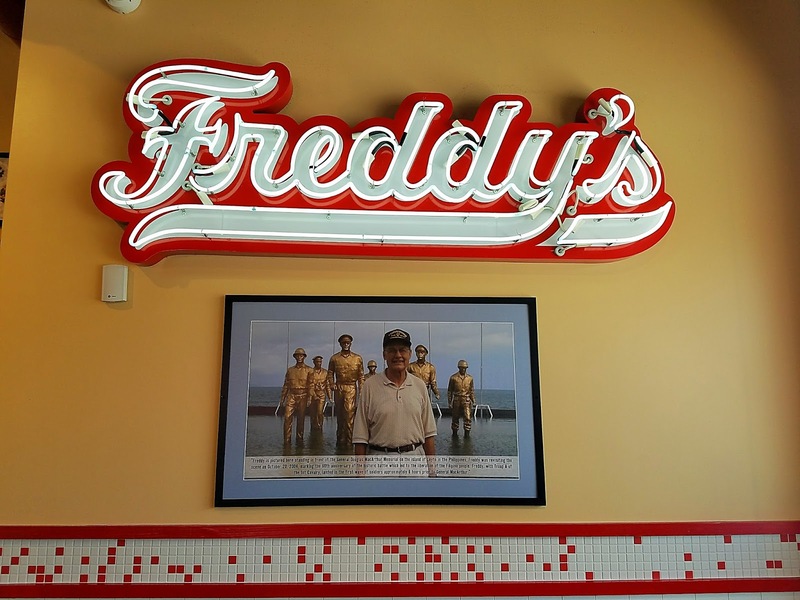 Today, Freddy’s restaurants from coast to coast serve a menu reminiscent of the all-American meals Freddy prepared for his family. The menu is pretty simple and straightforward here. Steak burgers, hot dogs, grilled chicken breast sandwiches and a variety of frozen custards. From steakburgers to sundaes, Freddy’s makes food fresh after you ask for it because that’s the kind of quality you deserve. The beef is lean ground and the hot dogs are Vienna beef only and they make classic shoe string fries. Inside is very open with an exposed ceiling and and AC ducts to make the location feel bigger than it actually is splashed with lots of Freddy’s favorite color of red. The Bacon and Cheese Double Steakburger is made with lean American pure ground beef with no additives or fillers. They press the patties thin to create deliciously crispy edges and always cook them to order so they’re steaming hot. This is then topped with seasoning, two slices of melting cheese, mustard, onions and crunchy pickles and bacon all on a toasted bun. The Original Double Patty Melt consists of two steakburger patties, Swiss cheese & grilled onions on toasted rye bread, and it is really good. At the drink station, they have ketchup and Freddy’s sauce for your fries. The sauce is a mayonnaise based sauce and if you like it hot, they have a jalapeno based sauce as well. Of course steakburgers here are really good, but you have to get a frozen custard if you visit. The good news is they have a snack size that's just right if you don't have much room left. On the left is the Signature Turtle Sundae with fresh & creamy vanilla custard, hot fudge, hot caramel, toasted pecans, whipped cream & a cherry, on the right is a Hawaiian Delight with vanilla custard, pineapple, strawberry, coconut, macadamia nuts. Both were delicious. Yes , Freddy’s is a chain, but they are far and few between at the moment. The burgers are quite tasty and made fresh when you order, and the crisp edges are pretty savory. I've been a few times to this location, and it’s a guilty pleasure of mine. 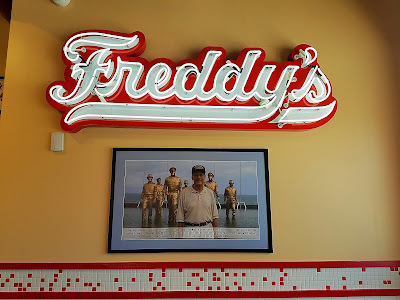 Freddy’s compares to a Culver’s or a Steak & Shake, but I think they are a cut above both. This location is open on Sunday to Thursday from 10:30 a.m. until 10:00 p.m. and Friday to Saturday from 10:30 a.m. until 11:00 p.m.
Stop by and try them out if you have not already. I've yet to have a bad meal here, and always leave satisfied.